Explain the principle of superposition with figures that show the changes in the wave amplitude. This is College Physics Answers with Shaun Dychko. The Principle of Super Position says that the resultant wave is going to be shaped such that you have the sum of the two component waves. So, we can take the position of this wave here and this wave here. That suppose this is positive one and this is negative one. And the sum of positive one and negative one is zero. And so that would be the position of our resultant wave. And of this peak is positive two and this peak here is negative two, that's going to give a super position of zero, as well. 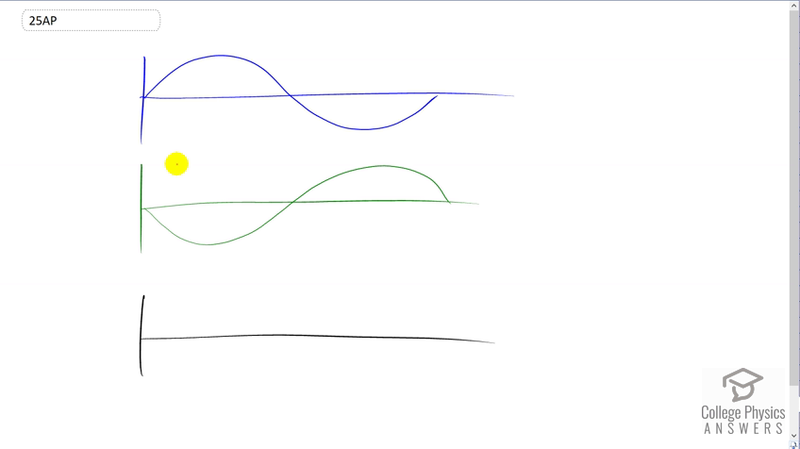 And I've just drawn these two waves such that they cancel each other out. And if you've ever used noise cancelling headphones, this is the principle that they're based on, is that they have a microphone in them that can detect ambient sound from the environment and then there's a little what was a speaker in the headphone, obviously, that's what creates the music. And but there are also an additional signal added to the music which is meant to cancel out the ambient noise that a microphone within a headphones have detected.